Low back pain (LBP) is one of the most common conditions I see in my office, and if you have low back pain, you are not alone! Achey, stiff, sore at best, and burning, spasming, shooting at worst– a hurting low back can affect all aspects of your life. The low back is the foundation of the spine and provides support for all of our movements. This large impact is what makes treating the low back so important – so that you can go about your life without constant discomfort and nagging pain. 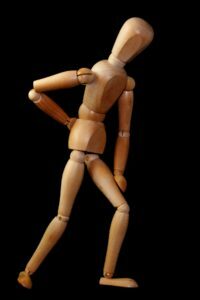 Why is low back pain so common? Whole books are written about this subject! Two likely causes are our lifestyle in the Western world and the biomechanics of the human form. In the West we do a lot of sitting. Sitting is the Olympics of the low back! The rounding of the spine, the forward head posture, the static-ness, and the shortening of the front hip muscles all combine to put pressure on the low back and over time create LBP. In the West we also stopped physically squatting as a part of everyday life. In comparison, people in indigenous cultures often do a great deal of squatting. Squatting happens when cooking near a fire, harvesting plants, or even going to the bathroom. Squatting down was part of our evolutionary history. Now we rarely squat and as a result we have lost muscle tone and range in our hips. This tone and range plays an important part in maintaining low back health. As for the biomechanics of the human form, the fact that we stand up on two limbs creates a potential for LBP. When you compare us to a four-legged animal, such as a dog, four-legged animals have a near absence of things like scoliosis, the painful curving of the spine that is so common in humans. My professors at Cornell would explain how the act of bending for the upright human loads the low back with a force equal to four to five hundred of pounds of pressure! And this pressure increases tremendously as soon as we bend while holding something. You can imagine how this can create injuries and pain. But we are not doomed to having low back pain, as indeed not everyone has it. Instead, we can develop strategies to heal and reduce LBP—strategies I use in my office every day. Relieving a client’s low back pain. Treating low back pain can require a comprehensive approach. Due to the many aspects at play, finding adequate massage care can be a challenge. Through years of practice I found there are several key categories to address – of which hands on massage work is only one. To help my clients with low back pain I have undergone training in each of these areas. My goal is to give my clients the most comprehensive treatment available so that they can live pain free. To learn more about my approach to healing LBP, make sure you check out the video above. In it I demonstrate some of the massage techniques I use to address the muscles of the low back. Relief from low back pain is possible. Experience the benefits exceptional massage care can provide for you. Book your session today.